Conference Series Ltd organizes 1000+ Conferences every year across USA, Europe & Asia with support from 1000 more scientific Societies and Publishes 700+ Open Access Journals which contains over 50000 eminent personalities, reputed scientists as editorial board members. World Nephrology 2019 conference brings together individuals who have an interest in the field of Nephrology and Therapeutics including Acute Kidney Injury, Nephrology Nursing, Pediatric Nephrology, Clinical Nephrology, Kidney Stones , Renal Dialysis . It is a forum to explore issues of mutual concern as well as exchange knowledge, share evidence and ideas, and generate solutions. This event is suited to anyone with an academic or professional interest in Nephrology and its research; including Researchers, Senior scientists, Nephrologists, Professors, Doctors, Nurses, Healthcare Professionals, Pharmacologists, Clinicians, Directors of Association and Societies, Postgraduate students and those who work in research and development of Nephrology and related technology. 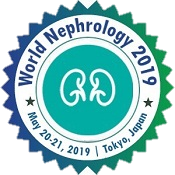 World Nephrology 2019 conference is an opportunity to meet others within specialty to network and to learn the latest clinical information. This activity has been designed to meet the educational needs of CEOs, CMOs, physicians, physician assistants, Nephrology Specialists, Pediatricians, Pharmacists, Students surgeons, psychologists, nurses, behaviorists, program administrators, and other professionals from hospitals, ACOs, private practices, large group practices and clinics. Those who are currently involved in the Kidney care individuals or exploring opportunities that provide a total wellness solution are encouraged to attend. World Nephrology 2019 has a particular interest on the impact changes in Nephrology and the awareness is increasing every year, and therefore World Nephrology 2019 encourages submissions from researchers based in USA, Europe and Asian countries. The challenge of the field is to evaluate current promising interventions rigorously, address emerging issues such as synthesizing ever-increasing research findings, and develop innovative dissemination and communication strategies. 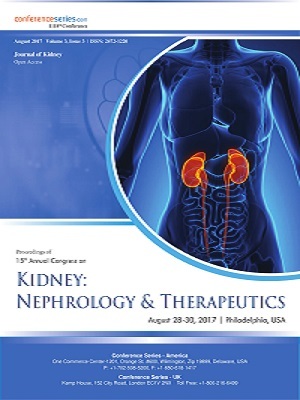 The journal invites submissions on research in Nephrology and Therapeutics including Acute Kidney Injury, Nephrology Nursing, Pediatric Nephrology, Clinical Nephrology, Kidney Stones , Renal Dialysis and topics related to Nephrology. World Nephrology 2019 provides a platform that helps authors to share their knowledge with a wider audience, and sustains a rapid process for submissions resulting in high quality publications. We further aim to contribute towards reducing the inequity in publications from low- and middle-income countries. Our audience is global and we intend to share research results in Nephrology from all parts of the world.